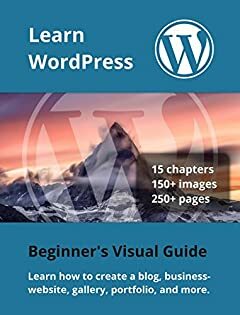 This book gives a visual explanation of how to create the most common websites with WordPress; a blog, gallery, business-page and portfolio. First you will get an introduction to the set up process of WordPress including choosing a web hosting service. You will get an explanation of how to use WordPress' interface and customizing your website's appearance using "Themes". The book explains how you can add and customize pages and posts. Adding extra functionality like a contact form, email-subscription, embedding media from your own computer and from other platforms like Twitter, Instagram, Youtube and Soundcloud, to name a few. You will understand how you can easily add any extra functionality by installing "Plugins". You will get a list of the most common and popular "Themes" and "Plugins" for WordPress. The book also gives a quick introduction to HTML, CSS, PHP and MySQL which are the underlaying coding languages for the Web and WordPress.